A top-notch custom exhibit is created from strong and durable materials. When choosing which materials to work with, it’s important that you consider the style you’re trying to achieve with your exhibit design. There is an endless array of finishing options and materials to use, so every exhibitor can get a booth tailored to who they are in a fun and unique way. Custom exhibits created using tension fabrics feature a frame, typically constructed from wood, steel, plastic, or aluminum, and a strong fabric cover. This fabric cover is stretched over the frame and the exhibit takes its desired shape. Our expert team of craftsman know that tension fabrics are a popular trend right now, giving exhibitors the ability to create any shape they’d like while keeping weight and drayage costs down. Nikon at CES | Exhibit design is the property of Nikon Inc. All Nikon trademarks are the property of Nikon Corporation. Gilbert uses a variety of hardwoods to create custom trade show displays. With access to a large array of stains and lacquers, our finishing department elevates wood-made exhibits through the use of decorative finishes. Gilbert has experience in using reclaimed wood for clients looking to showcase a rustic vibe. Laminate is also a fan-favorite, and offers a cost-effective alternative to wood. We use metal materials when we want to create custom exhibits that have a rustic element and industrial vibe. Metal materials can be customized to fit a variety of preferences through finishing. Gilbert takes pride in using high-end materials in our custom exhibit designs. That’s why they always have their eye out for new developments in plastics, acrylics, and resin materials. 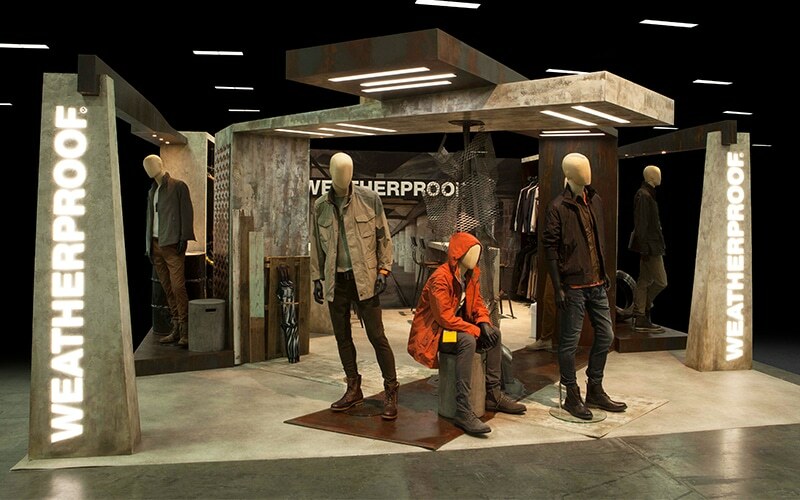 Plastics and acrylics create smooth slick, heavy, and translucent trade show booth designs. Clients who are seeking a top-notch exhibit design will get what they want with these materials. Choosing the right material to create your custom trade show exhibit can be tricky, but when you partner with an experienced exhibition design company, you will get exactly what you’re looking for.